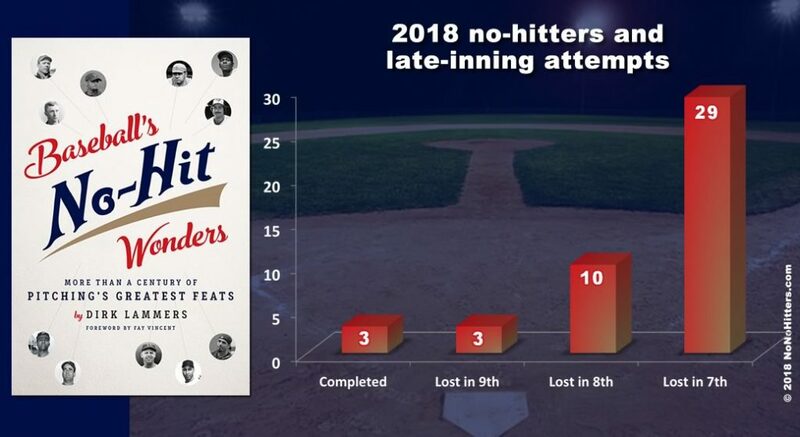 The Oakland Athletics’ Sean Manaea, a four-pitcher tandem of Los Angeles Dodgers and the Seattle Mariners’ James Paxton threw no-hitters in 2018, but not all efforts were so lucky. Here are the 2018 efforts that reached the seventh inning before failing. First Canadian-born pitcher to throw an MLB no-hitter on Canadian soil. Spoiler: Chris Taylor, lined single to left with two out in the ninth inning. Spoiler: Lopez walked Max Kepler to lead off the ninth to end the perfect game bid, and Robbie Grossman followed with a single to kill the no-no. Spoiler: Colin Moran, single to right to lead off the ninth inning. Spoiler: Christian Walker hits a deep fly ball to center, and Franchy Cordero misreads it and takes a few steps in before backtracking and letting it hit the grass behind him for the game’s first hit, an RBI double. Spoiler: Brandon Belt check-swings a soft grounder down the third-base line into the shift with two outs and beats out the throw for an infield single.. Spoiler: Jonathan Schoop tags Pressly for a two-out single up the middle. Spoiler: Isiah Kiner-Falefa, line-drive single to right off Blake Parker with one out in the eighth. Spoiler: Greg Bird, RBI double with one out in the eighth. Spoiler: Phillip Ervin, lined single to right off Jordan Hicks with one out in the eighth. Spoiler: Trevor Story lines a one-out single to left to break up the perfect game and no-hitter. Spoiler: Yonder Alonso led off the eighth inning with a single to right off Betances. Spoiler: Carlos Correa drew a leadoff walk to spoil the perfect game; Josh Reddick followed with a double to kill the no-hitter. Spoiler: Tim Beckham lines a leadoff double right between the legs of third-baseman Josh Donaldson, but it’s scored a hit. Spoiler: Miguel Rojas singles up the middle with two outs in the seventh inning for the 7,881st Padres game with no no-hitter. Spoiler: Paul DeJong spoils the perfect game in the seventh inning with two-out single down the third base line. Spoiler: Asdrubal Cabrera, two-out double to right. Spoiler: Russell Martin, two-out RBI single to left. Spoiler: Trevor Story, two-out double to left in the seventh inning. Spoiler: Todd Frazier, two-out single to left-center. Spoiler: Mitch Haniger, one-out double in the seventh inning. Spoiler: Eric Hosmer, one-out single up the middle in the seventh inning to break up Minor’s perfect-game bid. Spoiler: Jesus Aguilar, solo homer to left with one out in the seventh inning. Spoiler: Cory Spangenberg, two-out single to left-center. Spoiler: Jed Lowrie, single to center with one out in the seventh. Spoiler: Eduardo Escobar, line-drive single to right with one out in the seventh. Spoiler: Daniel Vogelbach, one-out infield single up the middle. Spoiler: Marcus Semien, one-out single to left field to kill the perfecto and no-no bids. Spoiler: Brandon Nimmo, single to right to lead off the seventh, breaking up Eovalidi’s perfecto. Spoiler: Joey Votto, single to right with one out in the seventh. Spoiler: Odubel Herrera, leadoff single up the middle in the seventh inning. Spoiler: José Ramirez, leadoff homer in the seventh inning. Spoiler: Trey Mancini, single to leadoff the seventh inning. Spoiler: Jed Lowrie, infield hit to deep short to lead off the seventh inning. Spoiler: Anthony Rendon, leadoff double to left in the seventh inning. Spoiler: Michael Conforto, single to deep short to lead off the seventh inning. Spoiler: Travis Jankowski, leadoff single to center to break up the perfect game. Spoiler: Anthony Rizzo, leadoff double to right. Spoiler: Freddie Freeman, leadoff homer to right-center field. Spoiler: Aaron Judge, leadoff double to center field. Spoiler: Chris Taylor, bloop leadoff single to right-center field.